This article discusses how you can solve the Three Reservoir Problem with Excel. First, we develop the governing equations by applying Bernoulli's Equation and the Continuity Equation. We then explore how these equations can be solved in Excel. If you just want the tutorial spreadsheet, click here, but I encourage you to read the rest of the article so you understand how the spreadsheet was developed. 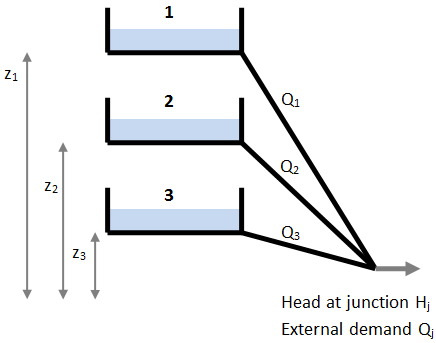 Read on for the Three Reservoir Problem solution. where zi is the elevation, fi is the friction factor, Li and Di are the length and diameter of the pipe connecting the reservoir to the junction, Vi is the liquid velocity and g is the gravitational constant. If Qi is positive, liquid is flowing out of the reservoir, and if Qi is negative, liquid is flowing into the reservoir. However, if we don't know the exact values of the flowrates in each pipeline (Qi) or the head at the junction (Hj) then we can define an error for each pipe. ...while keeping the total flowrate at the junction equal to the external demand. Step 5. Specify the errors for each pipeline (as given by Equation 7), and the total error (as given by Equation 8). 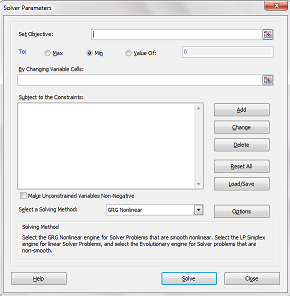 We can now use Excel's Solver Add-in to find the flowrates (Q1, Q2 and Q3) and head at the junction (Hj) that minimize the total error (as set in Step 5) subject to the flowrate constraint (as set in Step 4). Step 7. Make the appropriate changes in the Solver window such that you minimise the total error by varying the flowrates and the junction head while maintaining the external demand at a set value (for this example, I've set the external demand to 0.01 m3/s). Additionally, set the solving method to GRG Nonlinear. Step 8. Click Solve. After dismissing the following window, you'll find that the flowrates in each pipeline, and the junction head have changed. Bear in mind that positive flowrates indicate flow out of a reservoir, while negative flowrates indicate liquid flow into a reservoir. Step 9. We're not finished yet! Check that the Total Error specified in Step 5 is a very small number, and the External Demand (in Step 5) is equal to the value specified in Step 7.